Overcome night terrors today with effective Hypnotherapy by Dr. Steve G. Jones! Steve G. Jones, Ed.D., Clinical Hypnotherapist, charges $1,500 for a custom recording and $25,000 for a one-hour private hypnotherapy session at his office. But you can get all the benefits for this low price. Simply listen to the Stop Night Terrors Hypnosis MP3 every night as you go to bed for three weeks and feel the changes happening in your life. You will feel more empowered, more in touch with your true self, and you will truly know that your goals are within your reach. Don’t suffer any longer!!! It’s easier than you think. You’ll see a new you and you’ll feel great about it!!! Steve G. Jones achieves AMAZING and LASTING results!!! Hypnosis is the easiest way to affect change in your life because the positive messages go straight to your subconscious mind effortlessly so you can accomplish your goals and reach for the stars!! All you have to do is listen to the Stop Night Terrors Hypnosis MP3 audio at night as you go to sleep!!! You’ll hear soft music, the gentle sounds of the beach, and the soothing sound of Steve G. Jones’ voice all working together to bring about positive changes in your life easily and naturally. Steve G. Jones has been helping people improve their lives with hypnosis for over 17 years…now it’s time for him to help YOU… don’t wait, do it NOW !!! you’ll be glad you did. See you at the top! Have you ever been awoken at night because you were having a night terror? Night terrors are scary and can have a major impact on your sleep and your daily life. People have night terrors about their phobias, such as fear of heights or fear of spiders. Some people have night terrors about a traumatic experience they went through. And some people have reoccurring bad dreams that are unexplainable. Night terrors usually occur without the person realizing they had a bad dream. Oftentimes, they don’t fully awaken, but scream, gasp, or moan. The scary thing is that some people are not able to recall that they had a night terror, but they are frequently woken up in the middle of the night and this severely disrupts sleep patterns. Night terrors are not only hard for the person having them to cope with, but also other people in the household. If you or somebody you know suffers from night terrors, they should seek help. People who suffer from night terrors respond well to psychotherapy, hypnosis, or anti-depressants. There is help out there. And each night when you go to bed you will be at ease and relaxed. You will feel relaxed and calm knowing that everyday is another adventure even though some days will have problems and things we don’t like. Everyday will be an adventure, starting now. As you go to bed every night, you’ll be calm and at ease. Your mind and your body will be calm, tranquil, and relaxed. You will be able to sleep calmly, at peace, able to sleep the way you did when you were a baby, so calm, so relaxed, so completely at peace. You will sleep so well. You will be able to sleep soundly, knowing in the back of your mind that day by day you are beginning to live more fully, more deeply. As time goes on, you will live with more and more wisdom and you will let yourself sleep the way a baby does, when a baby feels good and very secure. You will sleep very well and very calmly and when you wake up in the morning you’ll be fully rested, very refreshed and at peace. Night terrors are controlled by your subconscious mind, so it makes sense that hypnotherapy would help eliminate your night terrors. You deserve to sleep a full restful night’s sleep. Hypnotherapy works on eliminating night terrors by using the power of suggestion. Steve G. Jones will give you suggestions that will eliminate night terrors. You do not have to suffer at night any more. You will want to listen to the Stop Night Terrors Hypnosis MP3 recording for 21 nights in a row before going to bed. The soothing sound of Steve G. Jones’s voice will allow you to relax and peacefully go to sleep and stay asleep without having night terrors. This hypnosis session will reprogram your subconscious mind to have positive and enjoyable dreams instead of having night terrors. You no longer have to worry about waking up in a panic in the middle of the night. You can rest easy. No longer will you stress over your night terrors during the day. You will be confident about eliminating night terrors from your life once and for all. 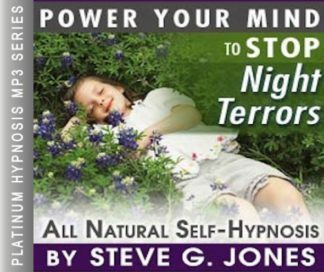 This powerful Stop Night Terrors Hypnosis MP3 download will give you the power to control your sleep. You are in control. Hypnotherapy puts you back into control. You no longer have to deal with night terrors. Hypnosis is very powerful and you might see results within one hypnotherapy session. If you are suffering from night terrors, you can easily put an end to these awful episodes with the Eliminate Night Terrors hypnosis recording.